This scarf was created by first dying the silk with rust, then submersing the scarf in a vat of Indigo. The scarf was then covered with a layer of miscellaneous leaves collected on Roanoke Island, and steamed over several hours for the plants to make their impressions on the silk. 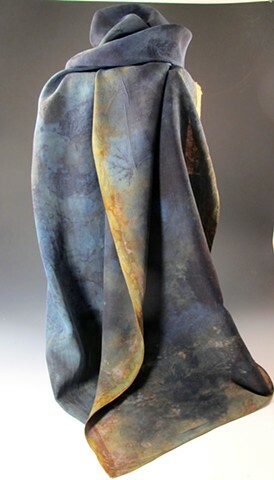 This scarf is incredibly organic and natural looking piece of wearable art.